The major lesson Chris Schwarz teaches in Anarchist’s Tool Chest is “disobey me”, and I accepted the invitation to do just this when I was planning the internal layout for my tool chest. Not that I have departed radically from what Schwarz built in the book. 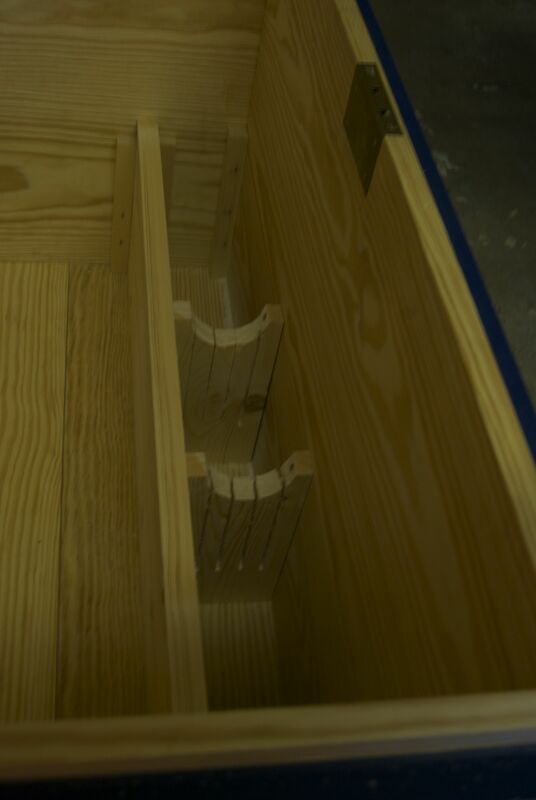 But because I wanted all three trays to be able to slide the full depth of the chest, I lowered the height of the saw till by a couple of inches so that the runner for the lowest tray runs across the side of the chest from front to back. Having lowered the saw till, I then decided that the posts on which the runners rest would be best placed in each corner of the chest, rather than using one of the cleats which secure the saw till. But I am getting ahead of myself, so let me explain how I went about fitting the saw till, moulding plane corral, and runners. In my last post I have finished building the saw till and moulding plane corral, and now needed to fit them to the chest. Before I did so, I cut from 1″ square pine four 11″ posts exactly to length, and nailed these into each corner of the chest using 4d fine finish standard cut nails. These posts establish the datum for the runners to rest on. 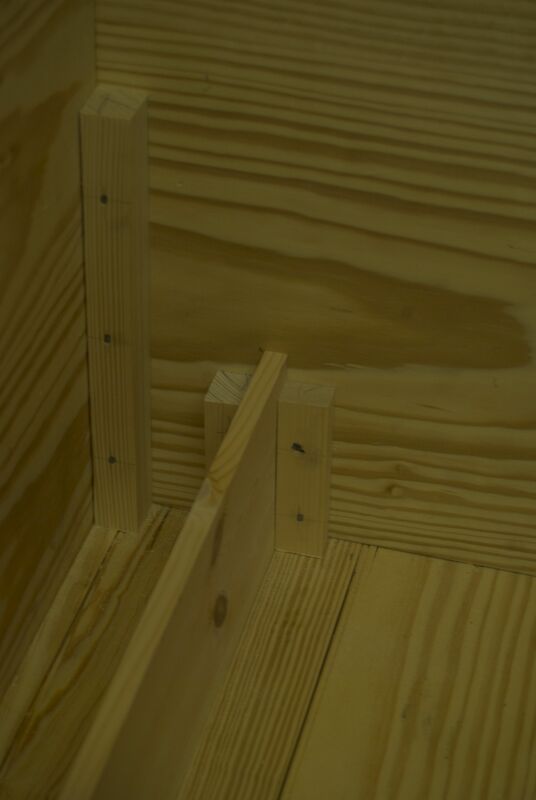 From the same 1″ pine I also cut four 9″ long cleats to secure the saw till in place. Clamping two cleats to the saw till wall, I drilled pilot holes and nailed the cleats to the side of the chest, again using 4d cut nails. The cleats at the other end of the saw till were installed using the same method, and although the saw till was rock solid at this point I also screwed the top of each till to the front of the chest with a 1″ No.8 brass screw, which I countersunk into the till to avoid scratching my saws. 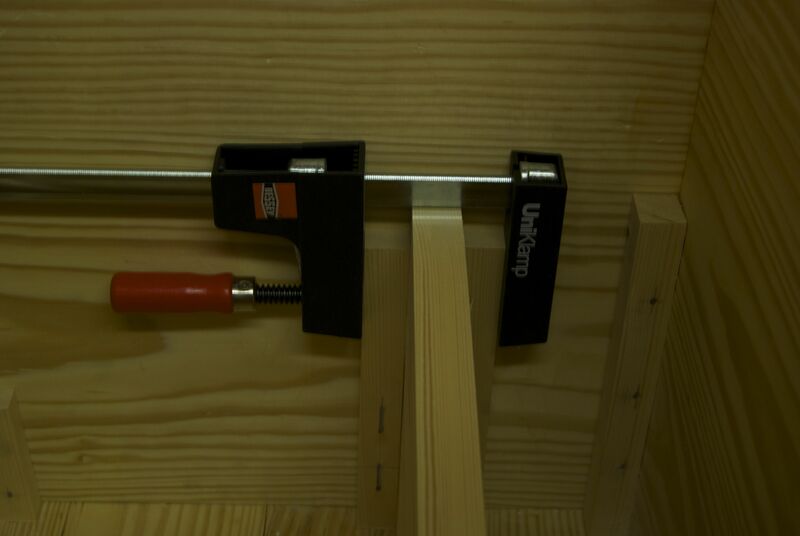 The moulding plane corral was secured in exactly the same way, although the cleats were significantly shorter than those used to hold the saw till in place. 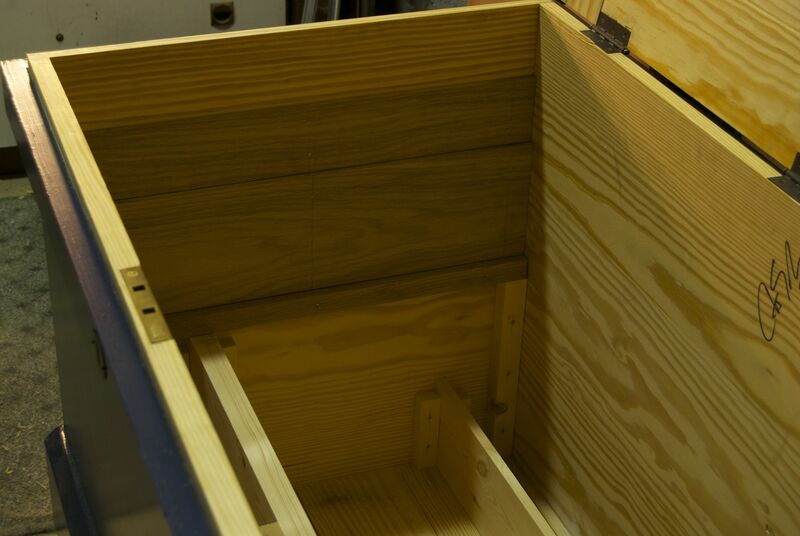 The tool chest will have three sliding trays, the top two of which will be 2 3/4″ deep, and the bottom being 5.5″ deep. The runners for the trays are made of hardwearing oak, with the bottom runner being 1″ square, the middle runner being 1/2″ thick and the top 1/4″ thick. I had previously cut these over length so that I could fine tune the fit when installing them. The ends were trimmed with my No. 9 1/2 low angle block plane (which really excels at trimming difficult end grain) until the runners just dropped into the chest and held with a friction fit. Each runner rests on the one below it, with the bottom runner sitting on the posts at each corner of the chest. So starting at the bottom I then installed each runner, drilling pilot holes for the nails before gluing the joining surfaces, pressing into place, and driving home the cut nails. 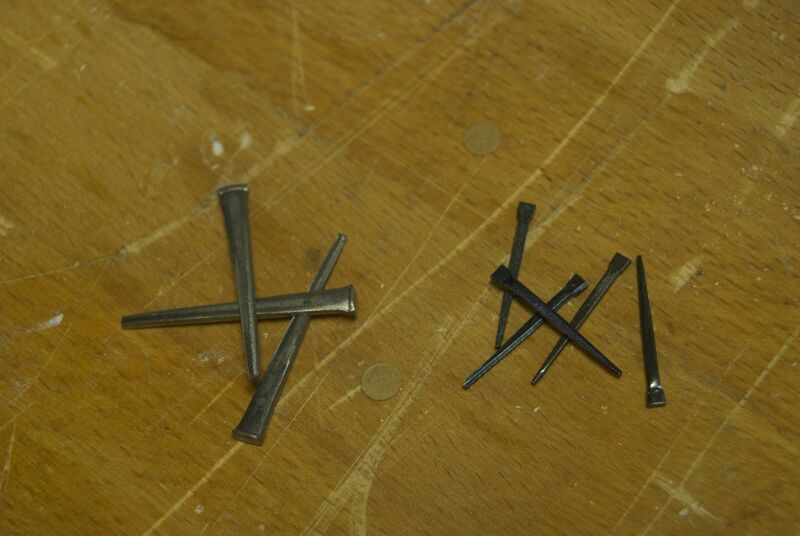 The glue should be sufficient to hold the runners in place for many years to come, so the nails are used firstly as a means of providing clamping force while the glue dries, and also in case the glue fails a long time in the future. If you don’t have suitable nails then go bars could also be used to clamp the runners, and this is something I may write about in the future. On the bottom runners I used 4d cut nails; one at each end and one in the middle, while the other runners were fixed with 2d cut nails; three along each of the top and bottom edges. At this point the chest is looking like a real tool chest, and only the three sliding trays are left to build before I can call this project done and start transferring my tools into it (which I am greatly looking forward to doing). This entry was posted in Anarchist's Tool Chest, Furniture Making by overthewireless. Bookmark the permalink.